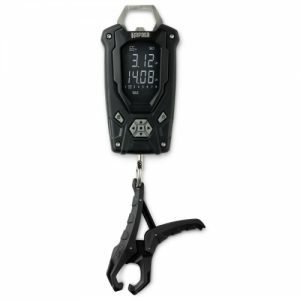 While not as good as the Rapala Touch Screen Tourney Scale, this scale is smaller, making it a good option for storing in tackle bags and backpacks. 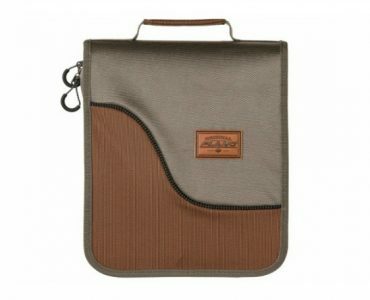 It stores up to 8 fish weights, and has a very nice non puncturing grip for securely weighing fish. After catching and weighing some bigger bass a few months ago, I realized it was time for a new digital scale. Not long after, I was scrolling Facebook when I saw a Pro bass fisherman with the new Rapala High Contrast Digital Scale. The scale had all the features of their popular handheld Tournament Scale, plus a fancy no-puncture lip grip. It looked sweet so I bought one. Inverse Display – Rather than the typical black digits on grey background, Rapala implemented a black screen with light digits. The purpose is to make the numbers easier to see in harsh direct sunlight. This works well with polarized fishing sunglasses. 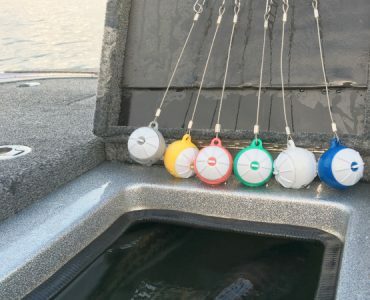 8 Weight Slots – Anglers can store up to 8 fish weights at a time. 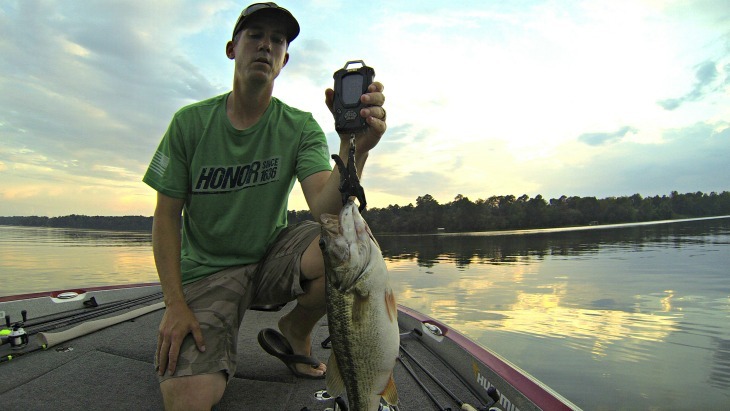 Weigh and save each fish during the day and the scale calculates the weight of a 5 fish limit. Use this with a culling system to speed up the process. 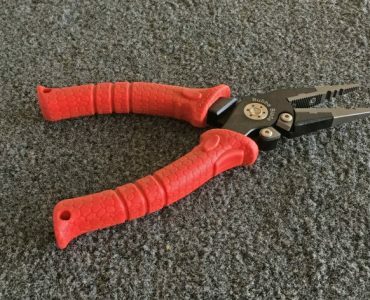 Fish Friendly Clamp – No more puncturing jaws or sliding hooks up gill plates. The plastic jaws securely clamp onto jaws and are much easier on fish. Choice of Units – Change the units on your scale to match your tournament. Choose between pounds with ounces or pounds with decimals, or kilograms. Memory Backup – The scale operates on two AAA batteries. Should the batteries die, there is an internal memory backup that saves the most recently stored weights until you can change the batteries. The scale body fits nicely in the palm of the hand. The plastic is textured for good grip, and has a red rubber gasket that prevents slippage. The grip clamp is only made of plastic, so I was interested to see how it feels in action. The LCD screen is large enough to easily see the weights. The reverse image takes a little getting used to, but it turns out to work well in bright daylight. I wish the screen was large enough to see all the weights at once, like on the Rapala Tournament Scale. But this is a smaller, cheaper scale after all. I also wish all the keys were slightly bigger, especially the directional keys. But, the keys work fine and they have a snappy click to them. The first thing to do is set the units. Hold the power key for 2 seconds, then push the power key when the screen flashes to choose your units. To store a weight, press the button with the Lock symbol. The weight will flash, then use the left and right keys to choose the memory slot, and push the center key to save. Use the same process to replace smaller weights over the day. You can use the down key and the scale will show you the MIN weight stored. To clear all the saved weights, push the up and down key at the same time until all slots are flashing. Press the middle button and all weights will be cleared. After a few weeks of testing, I think this is a decent digital fish scale. The weights have been accurate and consistent. I love the no puncture lip grip. 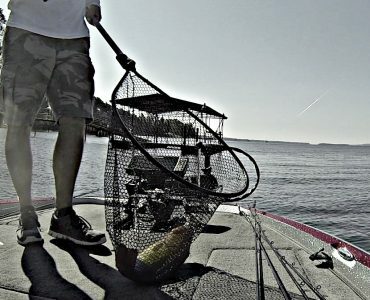 It’s fast, secure, and easier on the fish. The eight fish memory slots make it easy to track my livewell in a tournament and speed up the culling process. This scale doesn’t quite measure up to the Rapala Touch Screen Tourney Scale, but for the price is a good cheap digital fish scale for freshwater use. 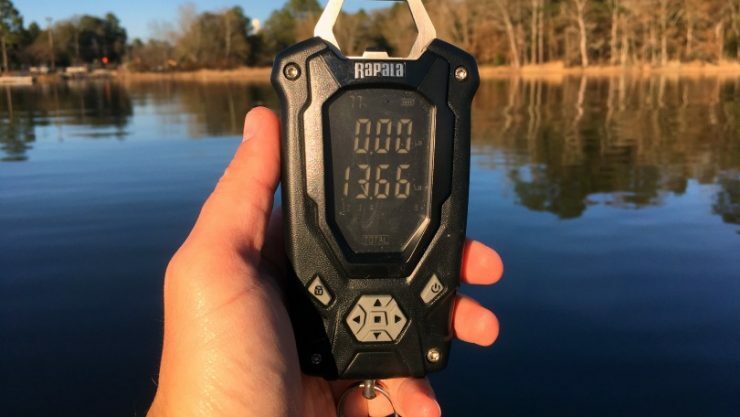 If you fish tournaments I would go with the Tourney Scale, but if you just want a good scale to track your success over a day, the Rapala High Contrast Digital Scale works great for a lower price.